Baccalaureate degree programs must provide a capstone or integrating experience that develops student competencies in applying both technical and non-technical skills in solving problems. To me, the key to this experience is the application of both technical and non-technical skills. Interestingly, when employers are asked to rank the importance of different skills for new workers, they generally focus on non-technical skills. In a recent survey of employers, the National Association of Colleges and Employers (NACE) ranked leadership; ability to work in a team; communication skills (written); problem-solving skills; communication skills (verbal); strong work ethic; and initiative, ahead of quantitative and technical skills in terms of importance. Complex design problem defined by external stakeholder and faculty mentor. Teams of interdisciplinary teams working towards a solution. Significant and ongoing opportunities for written and oral communication between the student teams, mentor and stakeholder. Our Electrical and Computer Engineering (ECE) program has been working with non-profit agencies for years through its Assistive Technology Program. Through these projects, students develop technological solutions for people in need (i.e., physical or learning disabilities, etc.). The program continues to grow in scope, with projects starting to reach beyond just ECE capabilities. Other Departments work with external partners too. Our Civil and Environmental Engineering Department has completed projects with the Massachusetts State Police while our Mechanical Engineering Department has completed projects with the National Parks Association. ME has also partnered with Physics to work on satellite design projects for NASA. Turning to industry for that “outsider’s viewpoint”, we launched a new Interdisciplinary Senior Design program two years ago with great success. This year, we ran 16, year-long projects for Computer, Electrical, Mechanical and Plastics Engineering majors with sponsors that included Analog Devices, BAE Systems, Brooks Automation, Dell EMC, MACOM, MKS Instruments, Nypro (A Jabil Company), Raytheon, Skyworks, Symbotic and UTC Aerospace Systems. In general, the students proposed a solution in the first semester (after significant research) and built a prototype in the second semester. While the solutions were great, I was more excited about the ongoing communications during the semester. The student teams were required to write a memo each week, detailing the advances for the week, next steps, and current (or potential future) concerns. This provided a running development log (augmenting project management plans as well as student engineering notebooks) and introduced the concept of risk analysis to students (by forcing them to identify current or potential concerns). It also served as a basis for weekly discussions between the students, the stakeholder, and the faculty mentor. In addition to the memos and engineering notebook logs, the students were required to write multiple reports, develop a summary poster, and deliver numerous presentations. The final presentations were delivered in front of all teammates, classmates, faculty advisors, and stakeholder liaison engineers. It was the perfect culminating experience to the capstone program for this year. And it illustrated that a properly defined and executed capstone design project can advance those skills identified by NACE to be highly desirable by industry. On Saturday, April 8, we will welcome hundreds of accepted students onto campus with family and friends to look at our College and University. It is an exciting time of year, although I know the decision of choosing a University can be daunting for a student and family. Competitors: Join a team and compete in concrete canoe, steel bridge, chemical car, SAE car, embedded systems, digital design, design-build-fly, solar house, wind energy and more! Designers: Hang out in our 8500 ft.2 Makerspace and take napkin sketches to computer-aided-designs to prototypes to final products using the latest equipment, including 3D-Printers, Laser Cutters, CNC Lathes and Milling Machines. Educators: The best way to learn something is to teach it to someone else. Our service-learning courses allow students to go into the community and teach STEM subject matter to middle and high school students. This can be formalized into a teaching certificate through our UTeach program. Innovators: Our DifferenceMaker curriculum cover the process of defining a problem, developing a solution, identifying a market, working in a team, and pitching a solution. Compete for real prize money to develop your product or service in our Prototyping Competition each fall and the Idea Challenge each spring. Professionals: Take the necessary steps to becoming a practicing engineer by participating in our professional co-op program, internships, or industrial experiences. Furthermore, the interdisciplinary senior design option will allow you to solve a problem posed by an industrial sponsor. Researchers: Explore cutting edge technologies in a variety of fields, including clean energy, nanomanufacturing, flexible electronics, composites, structural health monitoring, biomanufacturing, sensors, and smart transportation. And this is really just a taste of being a RiverHawk. There is always something happening on campus to motivate further learning. It really is no surprise that publications such as Payscale.com, BestColleges.com and Forbes define us as a great value. 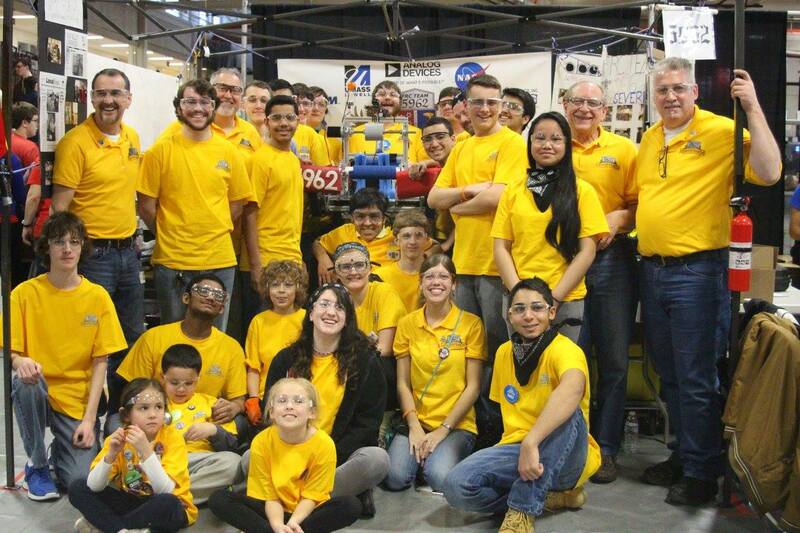 Alumnus Mike Johnston is at the culmination of an incredible rookie year with Merrimack Valley Robotics and the FRC 5962 team. At the start of this school year his team was just a small group of local kids hoping to add FIRST into their robotics club project. 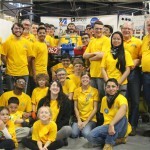 With 25 days before registration was due for the 2016 season, they were informed that the team could not be supported by the school. They were homeless, but, they were determined. The students shifted their focus, and aimed to create a team that was a collaboration of numerous local communities – rather than one town. Full of passion, they came to UMass Lowell, and asked for help. We were happy to offer our new Makerspace, which included many of the tools that would be needed to construct the robot. FRC 5962 then partnered with the Boys & Girls Club of Greater Lowell, and reached out to local schools to seek team members and additional mentors. Their recruiting efforts paid off, and the team grew to include students from Lowell, Dracut, Haverhill, Methuen, North Reading, Chelmsford, Tewksbury, and Tyngsboro MA and Salem NH. By December 1, more than 30 middle-school and high-school students had “moved in” to the Makerspace, prepared to spend the next six weeks (at times I’m sure it seemed 24-7!) designing and building a robot for the international FIRST (For Inspiration and Recognition of Science and Technology) Robotics Competition. The students put their technical skills to the test by constructing a robot that can complete a variety of tasks and games. Their creation, named “Scorpio,” is built with materials — and limited instructions — provided by the contest’s organizers. During the six-week period, team members learned to use power tools and run sophisticated computer programs under the guidance of engineers from companies such as Analog Devices, Kronos Inc. and IBM. Many of these mentors are UMass Lowell alumni. Scorpio measures approximately 2½ by 2½ feet and stands 18 inches high. The unit weighs about 120 pounds and is powered by a 12-volt rechargeable battery. Rookie All-Star Award – North Shore District Event: Celebrates the rookie team exemplifying a young but strong partnership effort, as well as implementing the mission of FIRST to inspire students to learn more about science and technology. Gracious Professionalism Award – UNH District Event: Celebrates outstanding demonstration of FIRST Core Values such as continuous Gracious Professionalism® working together both on and off the playing field. Highest Rookie Seed Award – UNH District Event: Celebrates the highest-seeded rookie team at the conclusion of the qualifying rounds. 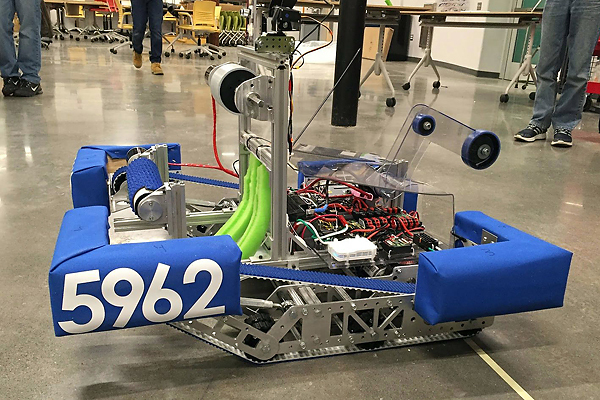 Rookie Inspiration Award – New England District Championship: Celebrates a rookie team’s outstanding success in advancing respect and appreciation for engineering and engineers, both within their school, as well as in their community. We are extremely proud of the dedication of PerSEVERE’s students and mentors and their AMAZING finish in their very first contest. It has been fun to witness the students’ energy and excitement for engineering while working away in our campus lab over the past several weeks. We look forward to more building in the future!